American Defense and European Theater Ribbons with three Battle Stars. Private Hayashi's extraordinary heroism and devotion to duty are in keeping with the highest traditions of military service and reflect great credit on him, his unit, and the United States Army. The following biography of Sgt. Joe Hayashi is based upon recollections of his surviving siblings, my aunts, Mrs. Chiye Watanabe, Mrs. Kiyo Hori, and my uncle, Mr. Seichi Nakawatase.--Compiled by Mark Nakatani, Joe's nephew. Uncle Joe was born in Salinas, CA on 8/14/1920. After his father was accidentally electrocuted on the family farm in Salinas, his mother, two sisters, Chiye and Kiyo, and Joe moved to Los Angeles and settled in Pasadena. Mrs. Hayashi remarried and Seichi and Shizuo were born. The family relocted to Heart Mountain during WW II and moved back to Paadena in 09/1945. Uncle Joe was athletic, playing football and baseball. He loved the outdoors with surf fishing, fresh water fishing and hunting quail as his hobbies. He was active in the Boy Scouts with Troop 41 of the Pasadena Presbyterian Church. He took kendo at the Japanese Cultural Center. He also enjoyed raising pigeons. He was also mechanically inclined, fixing cars and building his own boat. Uncle Joe was an innovative person as my Aunt Chiye and Uncle Sei recall, bottling his own root beer. Uncle Sei remembers root beer bottle caps popping off at night. Uncle Joe was remembered as being friendly, good-humored, straightforward and a fair person. He had many friends. He was not afraid of speaking his mind or defending himself or others as he did get in occasional fights. His leadership abilities were already well-defined in his youth. Uncle Sei recalls that uncle Joe used to hang-out with Max Robinson, the brother of Jackie Robinson, on the playgrounds near Pepper Street in Pasadena. Max Robinson later participated in the 1936 Olympics. Uncle Joe enlisted in the Army in March 1941. He was initially stationed at the Presidio, then went to Fort Sheridann, IL for 3 years, and then to Camp Shelby, MS. He attained the rank of Staff Sergeant after leaving the Presidio and became a drill sergeant for Company K of the 442nd RCT at Camp Shelby. Uncle Joe was originally scheduled to go home on furlough at the end of 1941. He was informed that his furlough papers were ready to be picked up on Friday, 12/5/1941. However, he decided to wait until the following Monday to pick up his papers. The Japanese bombed Pearl Harbor on 12/7/1941 resulting in his orders being frozen. 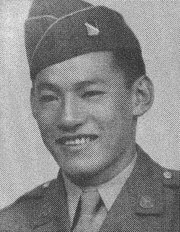 Due to the state of war declared againt Japan on 12/8/1941 and the extreme prejudice already in existence against those of Japanese ancestry, Joe along with other Japanese American soldiers were actually held as prisoners-of-war at Fort Stockton in the latter part of 1941. Uncle Joe also had a girfriend in Chicago whom he met while stationed at Fort Sheridan. No one in the family recalls her name and are not sure whether they were engaged. Family members recall that she did visit the family in Pasadena one time after the war. Uncle Joe was able to visit his family at the barbed-wire confines of Heart Mountain several times during the war. He also kept in touch through letters between his visits. Aunt Chiye recalls that Joe still remained very cheerful and friendly during his visits and doesn't recall any comments about his family's internment. In the fall 1944, Joe decided to volunteer for duty in Europe as he was tired of training younger soldiers that he knew would be killed in action on the European front. His last visit with his family was in late October 1944. Uncle Sei recalls his older brother telling him on that last visit that he would probably not be coming back home (as the fatality rate of the 442nd was so high). Uncle Joe's stepfather began suffering from liver cancer after arriving at Heart Mountain. Several months before Joe's stepfather passed away in December 1944, Uncle Joe contacted the American Red Cross to arrange better medical attention for his stepfather. Late one night, an ambulance secretly arrived at the camp and shuttled Joe's stepfather and Uncle Sei to a hospital in Billings, MT, about an hour and a half away. He spent several hours at the hospital but the doctors could do nothing for him. The ambulance took him back to Heart Mountain. This event really showed the integrity, character and compassion, that Uncle Joe embodied. Uncle Joe was cited for valor and heroism. He was shot by German sub-machine gun fire on 4/22/1944 and succumbed to his wounds out on the battlefield on April 23, 1944. He remained alive for several hours before expiring, and did not wish to be rescued in order to prevent his fellow soldiers from being fired upon by the Germans. Had Uncle Joe received medical attention, there is a possibility that he could have survived WW II. Uncle Joe lost his Sergeant's stripes and was demoted to Private during his tenure in Europe. As the story goes, Uncle was protecting some of his men who had returned to camp late after a night of carousing and were reported as AWOL. Previous CO's had let this slide by as these men were risking their lives in fierce combat situations. They felt that these men deserved to blow off combat stress as long as they showed up for combat. However, the new CO played by the book and would not cut any slack for these men, resulting in Uncle Joe being reprimanded and losing his stripes. Uncle Joe received the Purple Heart, Silver Star and Distinguished Service Cross posthumously after the war. However, it took 55 years for his heroism to be recognized for the Congressional Medal of Honor after the efforts of Senator Daniel Akaka of Hawaii who initiated having the records of JA WW II veterans reviewed for consideration for the Medal of Honor in 1996. The citation recognizing my Uncle's heroism for the Medal of Honor was the same citation used when Uncle was posthumously awarded the Distinguished Service Cross. Most of Uncle Joe's sisters and brothers (my Mom, Auties Chiye and Kiyo, and Uncle Sei) still live in or near the Pasadena area. Uncle Joe's younger half-brother, Shizuo, lives with his wife in San Jose, CA.